We discuss some recent progress on the two main unsolved problems in sub-Riemannian geometry: the regularity of geodesics and the Sard property for the end-point map. We will mainly discuss the group setting, focusing on Carnot groups. 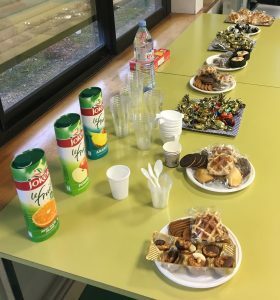 The results presented are extracted from several collaborations with Eero Hakavuori, Richard Montgomery, Gian Paolo Leonardi, Roberto Monti, Alessandro Ottazzi, Pierre Pansu, Davide Vittone. of a metric space from local ones. We will discuss in this talk the validity or non validity of the Besicovitch covering property on stratified groups equipped with sub-Riemannian distances (Carnot groups) and more generally on stratified groups equipped with homogeneous distances. We will illustrate these results with explicit examples in the Heisenberg group. We will also discuss some consequences related to the theory of differentiation of measures. Based on joint works with E. Le Donne and S. Nicolussi Golo. The growth of microorganisms is fundamentally an optimization problem which consists in dynamically allocating resources to cellular functions so as to maximize growth rate or another fitness criterion. Simple ordinary differential equation models, called self-replicators, have been used to formulate this problem in the framework of optimal and feedback control theory, allowing observations in microbial physiology to be explained. The resulting control problems are very challenging due to the nonlinearity of the models, parameter uncertainty, the coexistence of different timescales, a dynamically changing environment, and various other physical and chemical constraints. I will present some recent applications of control theory aimed at gaining a better understanding of resource allocation in naturally occurring microorganisms and microorganisms that have been genetically modified for biotechnological purposes. In this talk, we consider optimal control problems with two fast angular variables. Averaging the equations of motion over the two-dimensional torus is a valuable practice to gain understanding of the long-term evolution of the flow. Although the averaged system is only defined when the instantaneous frequencies are incommensurable, existing results guarantee, under fairly restrictive assumptions, that the drift between trajectories of the original and averaged systems is small for most initial conditions when resonant zones are crossed. After recalling these theorems, we discuss the application to time-optimal orbital transfer in the Earth-Moon system. Joint work with J.-B. Caillau et J.-B. Pomet. 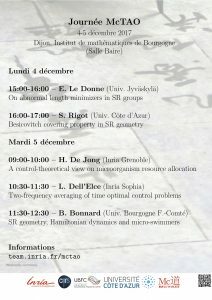 This talk deals with relation between sub-Riemannian geometry, Hamiltonian dynamics and micro-swimmers. Sub-Riemannian geometry is developped in the frame of geometric optimal control and from the Maximum Principle, the geodesics are solutions of an Hamiltonian differential equation. The optimal problem boils down to compute the conjugate and cut loci to calculate the sub-Riemannian sphere, combining formal and numerical methods. Adapted software provide a numerical evaluation of such objects and thanks to sub-Riemannian geometry, the injectivity radius is zero and homotopy methods allow to evaluate the sub-Riemannian spheres performing a continuation on the radius. We present an application of the various techniques to make a revisited analysis of micro- swimmers, based on the understanding of the swimming mechanism of an abundant variety of zooplanktons called copepods. Using this non academic example, a combination of geometric and numerical calculations on the geodesics equations determine the optimal solution, i.e. the most efficient stroke using continuation techniques initialized by strokes with small amplitudes. NB. Les deux demi-journées sont précédées par la soutenance de thèse de Zeinab Badreddine, le lundi 4 décembre à 10:30 (salle Baire).